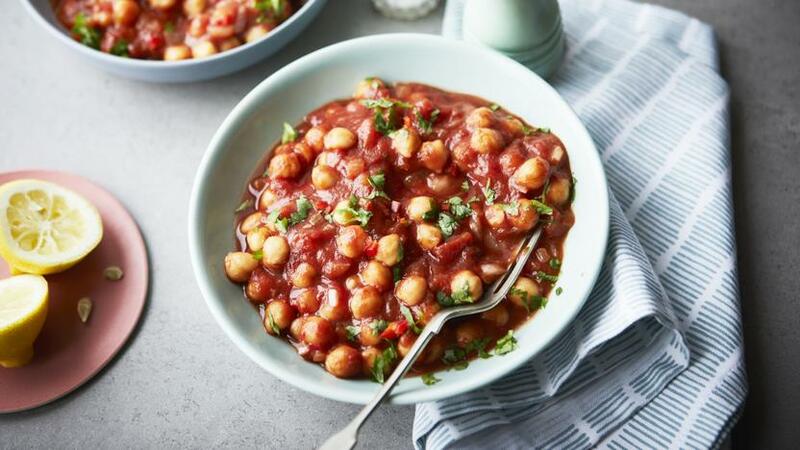 Hersha Patel shows you how to make a quick and easy vegan chana masala recipe that gives you a warm, cosy feeling in no time at all. Perfect for any season, this chickpea curry is one to bookmark. Each serving provides 327 kcal, 14g protein, 39g carbohydrates (of which 14.5g sugars), 10.5g fat (of which 1g saturates), 11g fibre and 0.6g salt. Heat the oil in a medium pan, add the onion and garam masala and cook for 5–8 minutes, until soft and translucent. Add the garlic, ginger, chillies and the chopped coriander, setting some coriander aside for garnish. Cook over a low heat for 3–5 minutes until fragrant. Add the chickpeas and tomatoes and bring to the boil. Reduce the heat and simmer uncovered for 20 minutes, until reduced to the consistency of thick soup. If it is looking too thick, add a splash of water. Remove from the heat, taste, and add the sugar, salt and lemon juice to taste. Serve sprinkled with reserved coriander leaves.